Esc is used to instantly close the game. 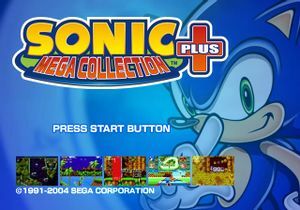 An updated re-release of Sonic Mega Collection previously available on Nintendo GameCube, featuring an emulated collection of 14 Sega Genesis/Mega Drive and 6 Sega Game Gear games. Some games must be unlocked through gameplay, however they can also be unlocked immediately via editing the game's configuration file. No option to disable the bilinear filtering used across this collection. At least on the European PC release, the ROMs used are the inferior 50 Hz conversions. Use Region Mod as a workaround. This collection is not available digitally, however some of the games featured in this collection have been released digitally elsewhere. Back up the game's original executable before using this mod. Allows the option to play between the North America, Japanese, and a fixed European version of this collection, as well as improving the sound quality of the Sega Genesis/Mega Drive emulation in this collection. Details on how to use this mod's features can also be found in this video and the included readme file. Download the mod here and extract the contents of the zipped archive to <path-to-game>. Replace the default executable with the appropriate ones from <path-to-game>\Modded EXE (U for North America, J for Japan, and E for Europe) and rename it to MegaCollectionPlus. 4:3 resolutions only. Resolution must be set in SETTING.INI by changing the value of Mode; 0 for 640x480, 1 for 800x600, 2 for 1024x768, 3 for 1152x864, 4 for 1600x1200. Uses a constant bilinear filter used throughout the games which cannot be disabled. The European release uses the 50Hz PAL version of the featured games. Use Region Mod for their 60Hz versions. Games in this collection are capped at either 60 (US/JP version) or 50 (PAL version) FPS. Requires pressing Esc or Alt+F4 to exit the game. D-pad and Left analog stick are bound to movement and cannot be remapped, which can cause problems for XInput controllers. References controls based on the Sega Genesis/Mega Drive. Only an option to mute all audio from the configuration launcher. Voice-overs are only heard in Comix Zone with speech bubbles unrelated to spoken dialogue are used throughout the game. Scroll down to the section under [ETC] and add the following underneath the line DELETE_TEX_LINE: SELECT_ALL_GAMES=1. Save the changes. You should now be able to play all games featured in this collection. Was able to switch the game's region to North America (which features text from the Xbox version) with this mod when applied to the European Sonic PC Collection bundle re-release. Used this argument founded in the Region Mod's readme file and it bypassed the configuration launcher requirement. Added the "4" in the Mode variable in the configuration file and got a resolution that was 1600x1200 according to ShareX's region capture function in fullscreen mode, but this resolution appears cut-off from the top when played in windowed mode. All games that were previously locked until meeting the requirements to unlock them became immediately available with this config edit.